Optimization is an essential strategy to make the most of every digital interaction in B2B marketing – focusing on improving your customer experiences through testing and personalization. How is your organization ensuring that every digital touchpoint with a visitor guides them towards becoming a customer as efficiently as possible? 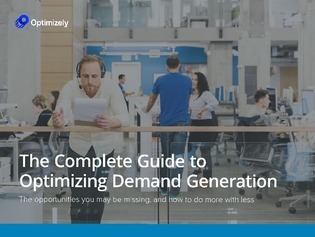 In this e-book, learn how optimization can amplify your current campaigns across all channels, allowing you to reduce the risk of developing digital campaigns that don’t generate leads.